Dominican Republic cuisine is predominantly made up of a combination of Spanish, indigenous Taíno, and African influences. Many Middle-Eastern dishes have been adopted into Dominican cuisine,[why?] such as the "Quipe" that comes from the Lebanese kibbeh. Dominican cuisine resembles that of other countries in Latin America, those of the nearby islands of Puerto Rico and Cuba, most of all, though the dish names differ sometimes. A traditional breakfast would consist of mangú, fried eggs, fried salami, fried cheese and sometimes avocado. This is called "Los Tres Golpes" or "The Three Hits". As in Spain, the largest, most important meal of the day is lunch. Its most typical form, nicknamed La Bandera ("The Flag"), consists of rice, red beans and meat (beef, chicken, pork, or fish), sometimes accompanied by a side of salad. The Dominican Republic was formerly a Spanish colony. Many Spanish traits are still present in the island. Many traditional Spanish dishes have found a new home in the Dominican Republic, some with a twist. African and Taíno dishes still hold strong, some of them unchanged. All or nearly all food groups are accommodated in typical Dominican cuisine, as it incorporates meat or seafood; grains, especially rice, corn (native to the island), and wheat; vegetables, such as beans and other legumes, potatoes, yuca, or plantains, and salad; dairy products, especially milk and cheese; and fruits, such as oranges, bananas, and mangos. However, there is heaviest consumption of starches and meats, and least of dairy products and non-starchy vegetables. Sofrito, a sautéed mix of local herbs and spices, is used in many dishes. Throughout the south-central coast bulgur, or whole wheat, is a main ingredient in quipes and tipili, two dishes brought by Levantine Middle Eastern immigrants. Other favorite foods and dishes include chicharrón, pastelitos or empanadas, batata (sweet potato), pasteles en hoja (ground roots pockets), chimichurris, plátanos maduros (ripe plantain), yuca con mojo (boiled yuca/cassava) and fritos (fried plantains). Bouillon cubes are used heavily in the preparation of Dominican lunch food. Guanimos – Guanimo, a dish that can be traced back to Mesoamerica Aztec and Mayan culture, are prepared exactly like tamales or halaca. Cornmeal or cornflour made into a masa then stuffed and wrapped with banana leaf or cornhusk. Arroz con leche o Arroz con dulce – rice pudding. Crème caramel – sweet egg custard known as flan. Coconut flan is known as quesillo de coco. mashed, boiled plantains can be traced back to west Africa. The origin name of this dish is fufu. Still called fufu in parts Africa, Cuba and Puerto Rico and cayeye in Colombia. This is a typical and official national breakfast in the Dominican Republic but can also be served at lunch and dinner. Mangú is typically served with queso Frito (white cheese fried in a pan), Dominican salami, eggs and topped with onions cooked in vinegar. This is also known as los tres golpes (the three hits). Arroz con almendras y pasas – A rice with raisins and almonds brought over by Lebanese. It is usually eaten around Christmas. Souflé de Batata con marshmallow – Is a casserole of mashed sweet potato, which is usually mixed with some orange juice. It is then topped with marshmallows and placed in the oven. This is another Christmas classic. Moro de guandules – The Dominican Republic has adopted arroz con gandules (yellow-rice with pigeon peas, pork, olives and capers) known to Dominicans as moro de guandules. Yaniqueque – Jonnycakes, a dish brought by sugarcane workers from the Lesser Antilles over a century ago. Kipes or Quipes (deep fried bulgur roll) – A version of the Middle Eastern kibbeh, brought by a wave of Middle Eastern immigrants that arrived in the Dominican Republic at the end of the 19th century. Pasteles en hojas – Tubers or plantains are grated and the paste is formed into a rectangular purse shape and stuffed with meat. They are then tightly wrapped in a banana leaf and boiled. 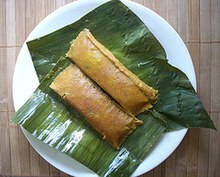 Pasteles are usually served on Christmas and as street food. They have become a staple in Dominican cuisine. Original from Puerto Rico. It is made from fried green plantains or fried yuca, seasoned with garlic, olive oil, and pork cracklings, then mashed with a little broth. Mofongo is usually served with a chicken broth soup. known as fritos verdes. They are fried green plantain slices served flattened and salted. Pastelitos – They are similar to a hand pie, usually fried and stuffed with beef or cheese. Arepitas in Spanish. Shredded yuca fritters mixed with eggs, sugar, and anise seeds. Bollitos de yuca o platáno maduro – cassava or sweet plantains fritters balls stuffed with cheese. Buche e perico – Literally parrot's cheek. A hearty corn stew made with mirepoix, garlic, tomatoes, cilantro, smoked pork chops and squash. Camarones con coco y gengibre – Shrimp with coconut and ginger. This dish is prepared with Dominican seasoning as a base and with the addition of coconut milk and ginger. Chen-chen – A cracked corn pilaf dish originating in San Juan De La Maguana with African influences. Chicharrón de pollo – fried chicken. Chimichurris – Ground beef or pork topped with Marie Rose sauce (mayo and ketchup), tomatoes, and cabbage in a hero bread. Rice dishes – Most dishes in the Dominican Republic are served with rice. A popular staple of the Dominican cuisine is arroz con maiz It combines the sweet flavor of corn with the salty flavor of rice and other ingredients. Locrio a classic style of mixing rice with other kind of meat, this dish is usually served with a salad, yucca or plantains. Moro de guandules con coco a rice, pigeon peas (guandules), and coconut milk dish. Concón isn't really something you cook on its own. Instead, it's a byproduct of cooking rice. Simply put, it's the layer of burnt hard rice left behind when cooking in a caldero (iron pot). It contains the most flavor. Soups – Dominicans take much pride in their soups and most cooks on the island claim to make the best soup. More than a third of the country’s total population lives in poverty, and almost 20 per cent are living in extreme poverty. In rural areas poor people constitute half of the population. Soup in the Dominican Republic are easy, cheap and can feed a large number of people. Chambre a legumes, rice and meat stew. Chapea a red or white beans stew with mashed squash, longaniza (sausage), and ripe plantains. Dominican Republic has also adopted many soups like sancocho the Dominican national soup, mondongo (beef tripe soup), asopao a rice soup made with chicken, pork or shrimp, crema de cepa de apio (celery root soup). Spaghetti a la Dominicana – Spaghetti cooked with milk, salami, peppers, onions, garlic, tomato sauce, orégano, and olives. Also served for breakfast, lunch and dinner. Telera – Dominican bread similar to Mexican Telera. Niño envuelto – Cabbage roll filled with rice. A dish brought over by Lebanese immigrants. Pan de coco – Coconut bread. Mazamorra – Mashed Squash topped with onions. Pico y pala – Pick and shovel. Chicken feet and neck is associated with the popular dining rooms and cafeterias, very common in low income neighborhoods. Usually cooked with onions, cilantro, culantro, oregano, and sugar. Guisados – Braised meat or fish cooked with sautéed bell peppers, onions, garlic, celery, olives, and cilantro. A small amount of sour orange or lime juice, tomato paste, water, orégano and sugar are then added. When done it is served with white rice. This is a popular staple in Dominican kitchens. Carne mechada is braised tenderloin or flank. Lengua picante – spicy cow tongue. Wasakaka – A sauce usually served on chicken made from citrus, parsley, garlic, olive oil, and chilis. Pastelón – Casseroles. A main element of Dominican cuisine. There are more than six variations in the Dominican Republic the most popular ones being pastelón de platano maduro (yellow plantain casserole) and pastelón de yuca (cassava casserole). Pastelón can be found in other Latin American Countries like Puerto Rico, Venezuela, Panama and Cuba, specially the eastern part which has great Dominican influence. Pastelón are usually stuffed with ground meat or chicken. Almibar de frutas – Fruit cooked in syrup. The most popular is called mala rabia. Guava, sweet plantains, and sweet potato with cinnamon. Arepa – Cornmeal and coconut cake. Dominican arepa is different from that of the Venezuelan and Colombian arepa. Bizcocho Dominicano – Dominican cake uses a basic cake recipe with vanilla, eggs, flour, sugar, margarine, and baking soda, but replaces milk with orange juice and lime zest. When done the cake is then filled with pineapple jam and frosted with meringue. Chaca – Corn pudding made with corn kernels, milk, cinnamon, clove and sometimes cooked rice. Conconete – Coconut macaroons with sugar, ginger and cinnamon. Dulce de leche cortada – Coconut macaroons made with sugar, shredded coconut and milk. Dulce de leche – Dominican dulce de leche is thicker than other Latin American countries. Dulce de leche is popular with pineapple jam in the Dominican Republic. Gofio – A sweet cornmeal powder from the Canary islands. Habichuelas con dulce – Sweet creamed beans dessert. Made with coconut milk, sweet potato chunks, etc. Jalao – Round-looking balls that are made with just shredded coconut and honey. Jalea de batata – Sweet potato pudding. Majarete – Corn pudding made with fresh corn, cornstarch, milk, vanilla and cinnamon. Some Dominicans add coconut milk and nutmeg. Polvorones – Crumbley rounded vanilla cookies covered in powdered sugar. Batidas – Brazilian smoothies very popular in the Dominican Republic. Guanabana smoothies are called champola on the island. What Dominicans tend to eat depends highly on where they live: whether near the sea or in the interior mountains. In either case, most Dominican meat dishes tend to involve pork, as pigs are farmed quite heavily on the island. Meat dishes tend to be very well cooked or even stewed in Dominican restaurants, a tradition stemming from the lesser availability of refrigeration on the island. Seaside Dominican fishing villages will have great varieties of seafood, the most common being shrimp, marlin, mahi-mahi or dorado, and lobster. Most villagers more commonly dine on cheap, lesser-quality fish, usually stewed with la criolla, a type of rice. Premium seafood tends to be too expensive for the many locals, and is saved for the island's upper class and the tourist resorts. Differences between Dominican cuisine and those of other parts of the West Indies include the milder spicing, which mainly uses onions, garlic, cilantro, cilantro ancho (culantro), ají cubanela (cubanelle pepper), and oregano. Dominican sofrito is known on the island as sazón. ^ "Food Crops". U.S. Library of Congress. Retrieved 2011-02-10. Castro, Marianela; Clavé, Montse; Alcántara, Luz María (1996). Cocina Dominicana: Volume 2 of Cocinas de allí, aquí. Icaria Editorial. ISBN 978-84-7426-277-3. Féliz-Camilo, Arturo (2012). Las recetas de Mamá Pura: Volume 1 El Fogoncito collection (Arturo Féliz-Camilo). CreateSpace. ISBN 978-1-4752-8083-8. Féliz-Camilo, Arturo (2013). Diccionario Culinario Dominicano (Arturo Féliz-Camilo). CreateSpace. ISBN 978-1-4840-1111-9. This page was last edited on 20 April 2019, at 23:49 (UTC).